Hello Everyone, I’ve been playing hearthstone since the beta and recently have hit legendary and cracked top 100. I’ve only laddered as Mage and been playing since beta with more home brewed decks then you can imagine. My first goal was to get 500 wins and have a golden hero and then collect as many golden cards as possible. After watching Otter get top 16 with his freeze Mage I decided to stop brewing my own decks and try his… I was stuck around rank 5 for a long time with that. Then I tried Duckwings Giant Mage and that was able to take me to the next level. I finally hit legendary with a unique combination agro/freeze deck. How did the deck come about? I always appreciated the raw power of agro mage, as well as the potential 13, 17, 21 damage spell combos. I tried for a long time to brew a mid range mage deck, or agro deck. They always seemed to have weaknesses, especially versus decks in the current meta pool. I tried to take the defensive aspects from Otter and Duckwings decks and really break it down. Versus Zoo it came down to nova/doomsayer more often then flamestrikes. I decided to add Nova/doomsayer to the agro deck. Additionally a many wyrm, juggler, and images can keep a zoo lock at bay early and the addition of iceblocks to give you an extra turn. What else sucked about agro mage? Umpff at the end! Mountain giants do not synergize well with these low cost minions of an agro deck, but molten giants would fit greatly. Many games the molten giants are the MVP, especially dropping 2 with an iceblock up. Alexstraza is great to heal or burst. So the deck plays out with you going hard at the start, and then stalling in the mid game, and then finishing strong. It works great in the current meta because it is different, but I think it has great potential. If people are interested I can provide a more in depth mulligan guide etc… I suggest watching the vods linked above, I was destroying the ladder with this yesterday, not sure what win percentage was in the vods but I was something like 25-10 yesterday. I prefer to think of this deck as an Agro deck with some freeze deck perks because that is how it came about. If you simply say it’s a slight variation of modern freeze Mage that’s fine too. Always looking for suggestions and plan to tweak this deck as always. Hoping to get rank 100 tomorrow night when the Season ends. Against most decks you want to be the aggressor early. However, since people expect you to be a typical freeze Mage, you can mulligan for card draw to support a semi rush. Against Warlock (assume zoo): Looking for Doomsayer, frost nova, Wyrm, Image, Leper, Loot Hoarders, Frost Bolt, juggler. The power of doomsayer board clear is too strong. Throwing them out without support at turn 2 or 3 is not a terrible idea, but if you clear board with them the game is usually a win. Against Miracle: Wyrm, Image, Juggler and Card draw. Since the rogue deck takes a while to setup you have time to put on some early pressure but then fall back into card draw. The acolytes are great to have here. Typically against rogue you will NEED an iceblock up to feel safe and hopefully a molten giant to back it up. Try to get them to burn removal early. Against Druid: Similar to zoo lock but keep fireball. IF they innervate out a large creature the momentum swing from fireball can lead to victory. Try to save your burst for after they heal, ideally your rush can force them to use heals on turn 7/8 and before Alex comes out… ensuring victory. Warrior: Ideally want wyrm, juggler, leper, loot + image and then card draw like acolyte of pain. If you can protect your creatures with image then you force out a whirlwind (which you don’t want him to save for his armor/card draw combo), or some other direct removal. If you can get him to burn removal on 2 early creatures your late game should take over. Stalling in the middle turns hoping to get 3 cards off your own acolyte. The lack of flamestrikes and blizzards are part of what differentiates this deck from either otters freeze or duckwings giant deck. Freeze mage relies heavily on the stall , and blizzard is actually just a bigger nova most of the time and the 2 damage doesn’t quite matter. Flamestrikes are amazing in giant deck and do extremely well against Azure Drakes, Auctioneers, etc. Those decks have very specific win conditions, which is basically stall for 9 turns then Alex/Burst or Giants/Alex/Burst. For both of those decks, having board clear is extremely important in the “later mid game” (turns 6-8). They rely on nova/doomsayer early board clear, then follow up with blizzard flamestrike for later board clear, and then they are setup for their win conditions. My deck works differently. By applying pressure right up front, you force them to fight off your board. 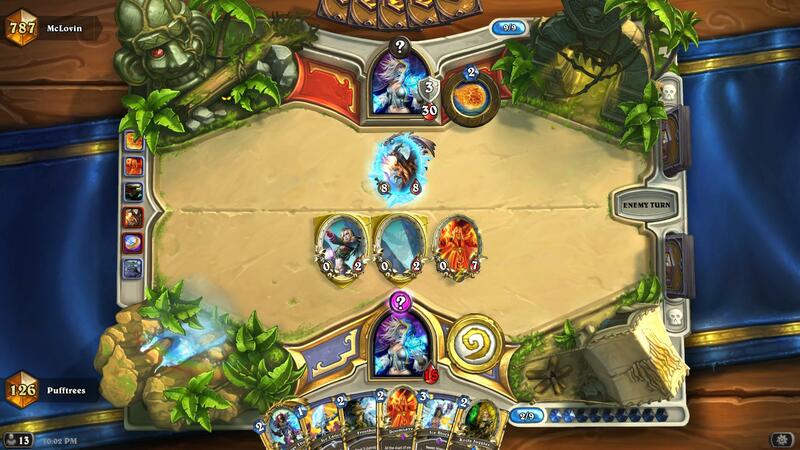 By the time they clear your board they should be around 20 hp and the game is proceeding into the “later mid game”. At which point, your doomsayer and novas can take over and perform the clear you were looking for. Even if they silence the doomsayer, you are delaying them, setting up for molten giants + burst, or alex etc. Think of it in phases. Freeze/Giant mage rely on delaying the early phase (armor, nova, doomsayer). Delaying the mid phase (blizzard/flamestrike). And nuking end phase (giants/alex/burst). My mage has aggressive early phase, delayed mid phase, and burst end phase. So the nova/doomsayers which are early delay in classic mage is moved to middle phase in my deck, making the need for flamestrike and blizzard go away.